On New Year's Day, Phil Moses was atop a ladder, putting some big news up on the marquis outside Ma & Pa's Grocery Express in Fond du Lac, Wisconsin. 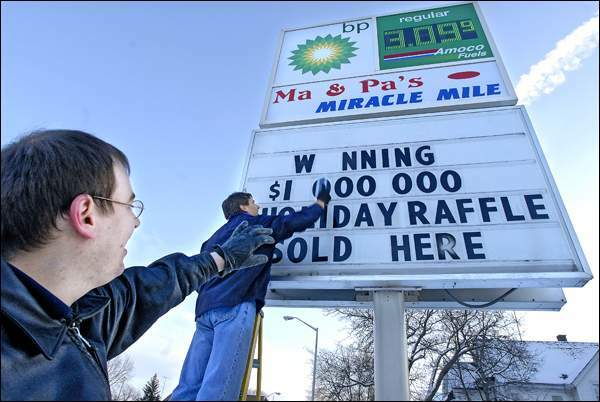 Another winning $1 million lottery ticket was sold at the legendary little store located at 506 S. Main St., along a strip dubbed "The Miracle Mile." "I don't want to sound arrogant, " Phil quipped, "but I seriously don't understand why people buy lottery tickets at any other location." A $100,000 winning ticket was also sold at Pick 'n Save, 55 W. Pioneer Road. Both tickets purchased were offered in the Wisconsin Lottery's Holiday Millions Raffle game. The winning $1 million ticket number was 300142. Both stores are waiting for the winners to come forward. "As far as I can tell, the ticket had to be sold within the last two days," said Gena Moses Singleton, sister to Phil, both of them employees and children of Ma & Pa co-owners Pat and Jim Moses. Wisconsin Lottery Director of Operations Andrew Bohage said the store has a cache of luck associated with it. "It's true that in the lottery industry, in general, those who sell the most tickets tend to have more big winners," he said shortly after drawing the winners on Tuesday. Ma & Pa's sold a $6.5 million Megabucks ticket in May 1994 and a $208.6 million Powerball ticket in August 2006. Since 1994 the "mom and pop" store has sold other winning lottery tickets that total over $1.2 million. "We are good people, that's why this is happening," Pat Moses said. "It's unbelievable. After the shock wears off, we're checking our tickets. We had pools here, too." The Lottery drew 511 winning Holiday Millions Raffle ticket numbers from the 368,477 tickets sold. Ma & Pa's sold the top prize ticket. Winning numbers are available right now at https://www.lotterypost.com/specialresults/wi-lottery-raffle-2008-01-01.asp. Phil said the store will receive a $100,000 commission from Wisconsin Lottery. With the commission from the $208.6 million win in 2006 they put in new gas pumps and took a cruise on Lake Winnebago.